Many experts now claim that underfloor heating is the best heating option for your house or business as it does not only save energy under the right circumstances but also improves the quality of air. Yet there are some basic facts that you should keep in mind when it comes to underfloor heating. Any material that covers a floor area comes with its own insulating properties with some materials having a better ability in changing the natural air flow of the room. Therefore extra care should be taken when choosing floor covering materials if you are planning to install an underfloor heating system. According to experts the best options for underfloor heating are carpet, laminates, hardwood, tiles and vinyl that have good heat conductivity. Most of the specialists always advise homeowners to avoid the softwood flooring or any kind of cork tiles as a floor covering material. Moreover, when installing an underfloor heating system you should never, ever lay the final cover on the floor on a wet or humid floor since this will hinder the performance of the system. One of the major problems faced by the house owners was that they did not look into the thermal resistance which is measure in the unit of togs when choosing a floor covering material. Essentially a high value of tog translates into a high level of insulation. So you can easily choose the best material for your home by checking its tog value. Once you get all of the above right then it is of paramount importance to follow the manufacturer’s instructions in order to properly install the floor coverings. Today there is a variety of underfloor heating systems that you can choose from with two of them being currently the most popular ones: the electric systems and hydronic systems. In order to install a hydronic system, you will need a professional certified plumber. These professionals have the necessary knowledge regarding the important parts that make up such a system which are boilers, controls, circulators, temperature and fluid pressure. Based on the experience and skill of the professional you have chosen the speed and proper installation of your system depends upon so this is task that should be taken lightly. 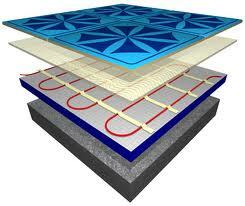 A hydronic underfloor heating system contains anti freeze liquid so as for the water inside the pipes wont freeze. Such systems use different types of fuels to operate like biofuel, biomass, solar energy, electric energy, wood, natural gas, oil and coal. Therefore you should consult an expert and do some research to figure out which fuel fits better with your budget and desired performance level. The other kind of underfloor heating system that is quite popular is the electric one that goes well with floor coverings such as tiles, laminated floors and carpets. Compared to the hydronic system it has a number of advantage such as the fact that it doesn’t require a boiler and it is much easier to install. On the other hand, you should be extremely careful and do a study on how much electricity it consumes and how much that translates into real money as you might be in for an unpleasant surprise when you start getting the bill from your utility company. A way to reduce your cost of electricity is by installing at the same time solar panel to produce your own electricity making your house eco friendly which is something you should look into with a professional solar panel installer. In any case, it is highly recommended to perform a running cost comparison between the two systems before choosing one. Underfloor heating does provide the best kind of thermal quality. After all it is no coincidence that underfloor heating systems date way back in ancient Roman times! In addition it also can improve the quality of air of your house and give you a better control over its humidity levels that results into fewer bacteria. Houses with underfloor heating in general have no mould, dust mites, viruses or any kind of harmful agents. Undeniably under floor heating systems is one of the best heating options for your house. But as already stated you should always make sure a number of things are in order such as the floor coverings you are placing. Therefore you should always get advice from a specialist in order to make the right decisions.